Sir Mark Elder's tenure at the helm of the Hallé Orchestra has been hailed as one of the cultural success stories of the last decade. 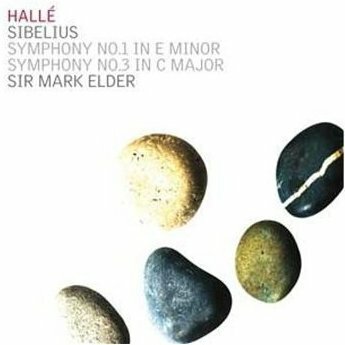 And anyone seeking proof of what a great orchestra the Hallé have undoubtedly become could do a lot worse than hearing this new disc of Sibelius, released on the orchestra's own label. The sound as captured here is thrillingly vivid: the strings can soar and dig, the brass are warm and assertive, the woodwind full of character. Elder's readings, too, are organically moulded and exciting, making it possible to recommend this disc, despite a couple of reservations, even in a particularly over-crowded corner of the catalogue. The First Symphony, in particular, is very well represented and this release comes only a couple of months after another recording – coupled with the fourth – with which Sir Colin Davis brought to a conclusion his latest LSO cycle, similarly on that orchestra's own label. If anything, though, I prefer Elder's more urgent and passionate reading of this score and the Hallé's more distinctive sound; there's a sharper, slightly more acid edge to the brass, while the strings simply sound more gutsy. Under his baton, the opening Andante ma non troppo is broad – faster and less hushed and dreamy than Davis, though – but leads into an Allegro energico that is exactly that: it brims with excitement and energy, showing an orchestra on extremely fine form. The wall of sound from the strings is more what one would expect from one of the great German or Austrian orchestras, and the sound of the wind and brass is wonderfully rich and full of character. Elder's grasp of the warm, romantic idiom of this most Tchaikovskian of Sibelius's symphonies is highly idiomatic and the results visceral; this is Sibelius with only a few glimpses of the frosty musical landscapes of the later works. Elder's control of the pacing is equally impressive and his responsive orchestra reacts to every minute fluctuation with interest. And while this makes for an exciting first movement, the Andante is brought out in irresistibly long-breathed paragraphs. The Hallé strings, in particular, play with a tone that is both rich and beautifully inflected. Like Davis, Elder's pulse is flexible here, allowing for surges in tempo, that sweep the listener along. The Scherzo comes as a sudden release of nervous energy, vividly drawn, before an impassioned account of the finale. The sheer sound of its opening bars – the rich strings with judiciously applied portamento bolstered by burnished chords from the brass – is arresting enough, but Elder also manages to maintain the forward thrust in a movement whose rhapsodic structure can leave some floundering. It's a hair-raising ride towards the movement's thrilling conclusion. Sibelius's Third Symphony inhabits a very difficult musical world, its modesty puzzled many after the supposedly gung-ho assertiveness of the Second Symphony's rousing finale. While No.1 here was recorded in studio conditions, No.3 comes from a concert in April 2007, sounding every bit as fine, with only the occasional distant cough and final applause to give the fact away. While undoubtedly a cooler work, Elder still finds a great deal of fire in it and the first full statement of the theme is bracingly done. At times there's a touch of impatience, however, later in the movement where the ostinati and sequences rattle on where there could sometimes be a little more time taken. The Hallé still play extremely well and the movement's forward momentum leads to several thrilling climaxes. Others have brought a greater sense of calm and repose to the Andantino con moto, yet Elder's emphasis of the 'con moto' makes for a reading of this movement that seems every bit as valid. The strings are moving when introducing the sustained idea around 3'40, while the gentle discourse between the wind instruments is nicely done. The unsure opening of the finale sees a little looseness of ensemble before getting under way with powerful thrust, woodwind interjections again full of character and vitality. Elder's impulsive readings contrast with the sometimes ascetic interpretations that this symphony's economy inspire and fine though this performance is, it seems less totally convincing than the First Symphony; there's a slight reluctance, it seems, in the third's finale in particular to sit back and let the music build up with the patience that's required. Nevertheless, these are still persuasive readings and further evidence of what an outstanding orchestra and conductor Manchester has in the Hallé and Sir Mark Elder.